I am so excited to see that Under Armour ® has come out with a line of ladies hunting clothing. Under Armour is paying attention and has taken note that women are driving the industry in purchases. It is more than just pink accents to attract our attention. 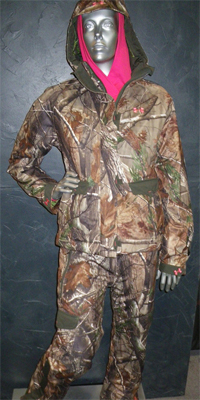 Under Armour has created a full line of quality, practical hunting clothing specifically fitting the physique of a lady. One item I often hear ladies asking for is breathable, water proof cold gear. Apparently, Under Armour heard them also. Under Armour’s ® answer to ladies breathable/waterproof cold gear is their upcoming “Quest” line. The line includes ArmourStorm ® technology which gives the huntress single wall core insulation. The benefit of single wall technology of course is it eliminates the traditional bulk of cold weather gear. With taperred seams and various adjustable features, the Quest pieces are ideal for layering. The Quest jacket is tapered to fit a woman's figure and still allows for movement and range of motion. There is plenty of room in the shoulder and hip area without a lot of loose fabric. The jacket includes a non-removable hood with extended visor design to eliminate water from dripping inside the coat. It has two large hand pockets as well as two cargo pockets with closure flaps to carry the many items required for a successful hunt without the risk of losing items while in the field. On the arms are additional small zippered pockets. The sleeves feature adjustable cuffs and the pink antlered Under Armour ® logo. Quest pants are tapered to fit a woman's figure as well with fully tapered seams and extra room in the hip. I was very impressed to see the addition of belt loops to this pant. Belt loops are a must for any hunting pant and Under Armour designers did not forget them. They are important for the ease of adjustment to fit and also for carrying your multi tool or handgun. Ladies, if you are not into wearing a belt with your hunting pants, don’t worry. They kept you in mind as well. The Quest pant features a cinch waist as well. Once again we find the pink antlered Under Armour ® logo on the cargo flap. With two waist pockets, two cargo pockets and two rear pockets, this pant is perfect for all your hunting calls, tags and accessories. The leg of the pant features a durable zipper going up the leg, nearly to the knee, and has plenty of room to pull the pant on or off over your hunting boots. There are a couple of additions I would like to see in future prototypes from Under Armour. One being both inside and outside chest pockets on the jacket. Another would be an interior gator on the pant with boot clip, velcro and snap closure. Other than those couple of items, I feel Under Armour hit the mark with their ladies Quest cold gear. They did not cut corners in the quality, construction or design of this product. It is exciting to see companies setting the bar so high in the ladies market. It won’t be long until we can field test this product. Under Armour® Quest will be available June of 2011.